With tablets, laptops, mobile phones and social media, we now take all of these for granted and accept that they are apart of our every day lives. A decade ago, could you have even predicted that this could have even been a possibility? Let alone written about any of it in a science fiction novel? In the case of E.M. Forster, author of A Machine Stops, he explored these themes in his prophetic novel written in the early 1900s. As social media now dominates the 21st century, does this spell the end for human communication? First Draft, performed by open Heart Surgery takes on the big themes of E.M. Forster’s novel, as pairs of characters attempt to make sense of the world. Dressed in navy blue factory suits, Charlotte Baseley and Louise Callaghan mesmerise with their abstract movement sequence at the very beginning. 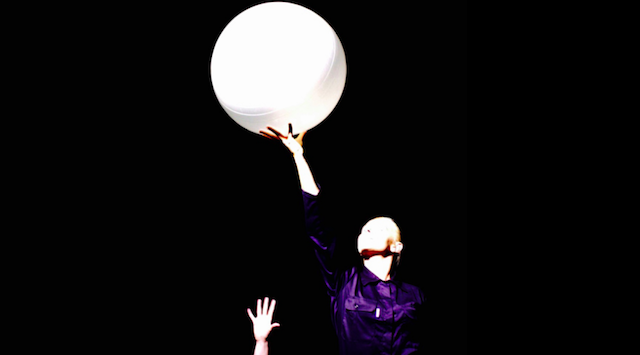 As the focus is placed on a globe-esque ball, the duo find themselves connected together as they attempt to keep the ball afloat. As one character rolls on the ball, another lifts it up and passes it back. A game of too and fro, there’s a magic that takes over the dark and mysterious location of the vaults.The concept of one’s personal space and the connections we all have as humans becomes prevalent. Performed alongside an ethereal soundtrack, and with zero dialogue, the audience are left to draw their own conclusions and read between the lines, making for powerful viewing. At the heart of First Draft is the new found friendship between the librarian of memories and dreams, and a factory worker longing to venture out and explore what the world has in store above ground. With both living a subterranean existence, and working for ‘the machine’, their blossoming friendship endears, highlighting the theme of humanity and how it will not be wavered, no matter how oppressed one may become. Although a common theme explored in the arts, the idea of a dystopian world will continue to intrigue, as our future gradually appears to be determined by technology created. The narrative takes on a very unconventional path, with short scenes commenting on the fast paced nature of the west, from a brash, all smiling, all talking American retail assistant advertising a lighter and leaner version of coffee you didn’t realise you needed in your life until now, available at your convenience at a coffee shop chain near you, to a perplexed elderly couple watching the news and commenting on the nature of the media picking and choosing which stories they wish to report.